Where is Springfield? What state do the Simpsons live in? There has been debate amongst fans of the animated series for decades now. The truth is, Springfield isn't associated any one particular location, but rather it is an amalgamation of the average mid-sized American city. According to Ken Jennings of Condé Nast Traveler, The Simpsons creator Matt Groening "gave the fictional burg the quintessentially generic middle American name to make it feel like a TV Everytown, and he's right: Springfield is one of the most common place names on the national map." Just how common is it? Out of the 50 states in the U.S., 32 have at least one Springfield, with a handful of states boasting as many as four. Collectively, that's 41 Springfields across America. Fans of the show will note that, despite the generic name, the Simpson family hometown -and, really, the world at large - is anything but. As Jennings further notes, "Springfield's [unnamed] state somehow has deserts, swamps, beaches, and glaciers...and it somehow borders Ohio, Nevada, Maine, and Kentucky." Moreover, this made-up town also features a nuclear power plant, a gorge, numerous museums, nightclubs, and a rich history dating back to colonial times. Given this, how do the real-life Springfields mirror the fictional world of the longest running television show in history? Here are real towns that have some close connections to the Springfield of The Simpsons. This Springfield is officially lost to time. Once the seat of Seward County, the town was officially vacated 1897 after it failed to secure a much needed railroad to connect it to the outside world. All that's left now is a historical marker and a rest area at the junction of US highways 160 and US 83. 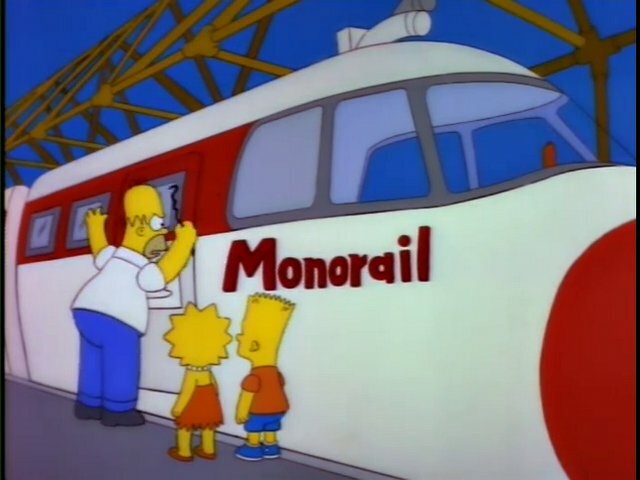 The Simpsonian Springfield, on the other hand, nearly suffered total ruin when they built a railroad they didn't need - or rather, a Monorail system sold to the town by Lyle Lanley, a huckster who knows to play off the town's weakness for a catchy song in "Marge vs. The Monorail." This episode marks the first of two guest appearances by Leonard Nimoy. This Springfield was once home to Arkansas House of Representatives member Rick Beck, who has been actively sponsoring initiatives typically associated with the Republican party (of which Beck is a member), including proposing many laws that loosen current regulations on gun ownership and conceal-and-carry licenses. Laws such as these have been cropping up over the last several years, all of them geared toward making it even easier to obtain a firearm in this country. 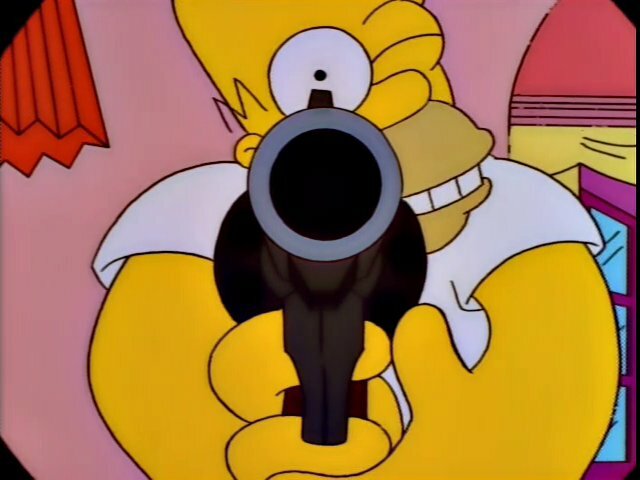 The Simpsons lampooned America's gun-craze in "The Cartridge Family," in which Homer successfully purchases a gun despite having been in a mental institution, having frequent problems with alcohol, having beat up former president George H.W. Bush and being labelled "Potentially Dangerous" by the gun store owner (which means Homer is limited to purchasing three guns total). This Springfield is most notable for being a former California Gold Rush boomtown. According to the town's entry on the Government of California Office of Historic Preservation website, "During the town's heyday, 150 miners' carts could be seen on the road, hauling gold-bearing dirt to Springfield springs for washing." This abundance of gold brings to mind The Simpsons episode "A Tale of Two Springfields," in which the town actually splits into two separate communities, Old and New Springfield. 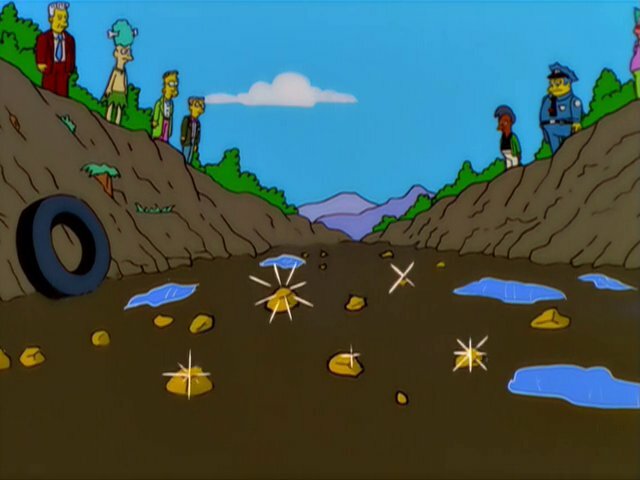 During a fierce rivalry between the towns, Homer, as Mayor of New Springfield, drains the water supply, revealing numerous gold nuggets in the now empty riverbed. This makes the citizens of Old Springfield wealthier than they already were, prompting them to purchase the Evian bottling plant, thus resolving their water shortage. Note too that at one time, the streets of fictional Springfield were paved in gold, according to Grandpa Simpson and his friend Jasper in "$pringfield (or, How I Learned to Stop Worrying and Love Legalized Gambling)." You'll find quite a few similarities between the Simpsons' home and this real-life city. A few years back, series creator Matt Groening revealed that the fictional Springfield was based on this town in Oregon, near his hometown of Portland. There's a bar there called Max's which is rumored to be the basis for Moe's, complete with a large jar of pickled eggs on the bar and an architecturally similar exterior. Gizmodo writer Jesus Diaz points out a few other locations that have animated correlations, such as the town's nearby lake, a baseball card shop (a portion of Comic Book Guy's store also focuses on sports memorabilia), and a convenience store that bears a striking resemblance to the Kwik-E-Mart. While many sources point out that there isn't a nuclear power plant nearby, this wasn't always the case. Though closer to Ranier, Oregon than Springfield, there was the Trojan Nuclear Power Plant, the only commercial plant ever built. 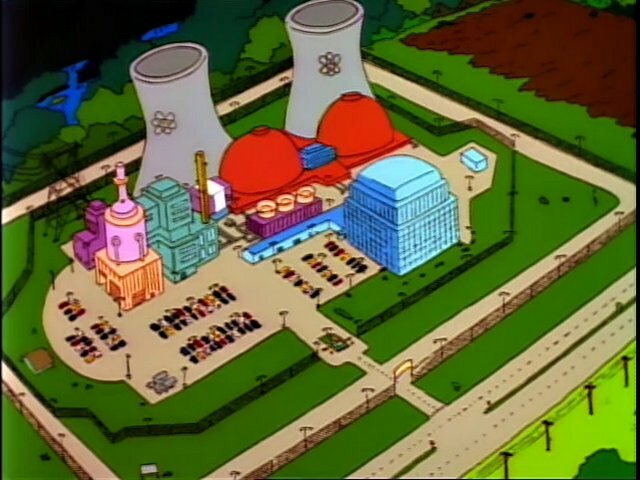 Despite only featuring one cooling tower instead of two, Trojan looked a lot like Mr. Burns's plant on The Simpsons.